In times of crisis we do not see the colour of anyone's passport. We do everything possible for people We want our youth to be job creators not job seekers. Skill development is very important I can tell you, India has the strength, what is needed is opportunity There is one solution to all the problems and that is development Whatever is happening is not due to Modi but it is due to the people of India There is a new atmosphere of trust in our Nation. It is not that only the Government has changed. 'Jan Man' has changed The decisions we have taken today have been taken in a friendly atmosphere. 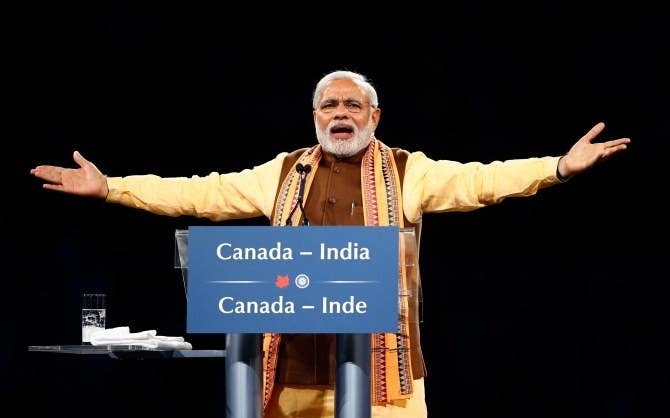 Our association is going to be very long India + Canada, can you image the strength this partnership has I came here yesterday and I will go back tomorrow but I will never forget your affection My experience of working with Canada has always been very good right from the time I was the Chief Minister in Gujarat.